Recruiting is happening at younger and younger ages, and with that, come some very big consequences for the player and the college coach. If you’re trying to get recruited you better know the 5 things that must happen first. There’s no shortage of opportunities for players to show coaches their skills in the hopes of being recruited. But are those skills ready for prime-time? Read on for the 5 things you must do BEFORE you get recruited. Showcases are everywhere and it seems that youth softball has reached a tipping point – no longer are kids playing to learn and win the game. Instead, the reason for playing centers around being recruited and being seen. Games are now only an hour long so more can be played. Winning doesn’t matter as long as the “right” college coaches are there, and your skills – who even thinks about those? Decisions like which team to play on, whether to “guest” on another team, or simply change teams mid-season are all common questions players and parents ask themselves now. Lessons are grabbed up as coaches insist their players learn specialized skills instead of the coach taking the time to teach kids their skills, and thousands and thousands of dollars are spent in the great chase to be recruited. Be A Solid Softball Player – It’s crazy that I even have to put this on the list, but BEFORE you think about what team to play for or what showcase to go to, you should think about building your softball skills. Take an honest hard look at yourself and then ask yourself (as my friend Nicole Tromboli says), “Do you honestly want to be seen now?”. 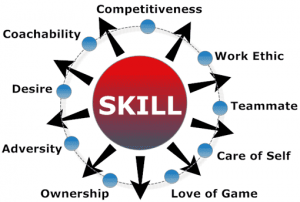 Are your skills well-rounded, solid under pressure, capable against the top competition, and can you compete and win? Or, do you just want to get a scholarship? There’s a HUGE difference between being a solid softball player with well-rounded skills that will help your team win at an older level, and simply playing to be seen. Coaches, it’s our job to develop and grow the skills our players have instead of simply shuffling players around like we’re coaching our fantasy football team. If you’re spending most of your coaching time scheduling showcases and finding new players, then are you really coaching? Webster’s dictionary defines coaching as: one who instructs players in the fundamentals of a sport and directs team strategy. We must spend more time teaching and growing and developing our player’s talents before we begin worrying about getting them recruited. If you do a great job building your softball skills then getting recruited will be easy because all good coaches want good, solid softball players. Grow your softball skills before you grow your college wish-list. Be A Good Student – Remember, it’s “college” softball so that means you not only have to qualify to get into whatever school you want to go to, but you also have to be capable of passing the classes and graduating. Show coaches how good of a student you’ll be by being a good student now! You might not like every class but pay attention in class, do your homework and do your best. Not only are you training your brain for the rigors that lie ahead in college, but you’re creating a road map for college coaches to follow in order to predict your success at their school. Don’t ever forget that “college” comes before softball when you say you want to play college softball! Be A Great Teammate – Softball is a team sport and you are trying to go to college to play on a team. Why would a college coach want to take you if you only worry about yourself, jump teams every time you don’t get enough playing time or don’t like the coach? The best way to show a college coach that you would be a great fit for their “team” is to be a great team player! Not just when you’re playing great, but particularly when you’re struggling. How much you encourage your teammates, accept your coach’s comments and treat the game with respect goes a L-O-N-G way in showing coaches how you’re going to do those things on their team. College coaches only want players who will make their “TEAM” stronger – not only on the field, but in the dugout, locker room and classroom as well. Be a GREAT team player! Be Dependable – If you say you’re going to do something, do it. Coaches want to know they can depend on you to do your homework, to do your workouts, to give your best, to keep getting better. Dependability is very important in this world. You’re also showing dependability when you stay on the same team. Always jumping teams tells coaches that you might jump their team. If you give a team your word that you’ll play with them, then play with them – through thick and thin. Once the season’s over then either work out your issues or move on. But if all you do is show college coaches a history of moving on then they’ll probably move on from you. They want players they can depend on through the good times and the bad! Have A Love of Playing Softball – And finally, do love playing softball! Not just being with your friends, and cheering in the dugout, and going to cool places, but do you actually love the practicing and the playing of softball, and all that entails. Playing softball means you love practicing and improving yourself. You love helping your teammates get better. You love fighting in a tough game so your team doesn’t lose. Loving to play softball means that you love to win and want to do anything and everything to help your team win – not to help yourself look good, or only worrying about playing if the right coaches are in the stands. Softball is a team sport so loving to play softball means that you love doing everything possible to help your team win – no matter who looks good that day! Loving to play softball means that the work involved with developing good softball skills is something you enjoy. Being really good takes really hard work. If you enjoy the work then you’ll no doubt love playing softball – and every coach wants a team full of players that love to work and play softball! Playing softball with the dream of one day playing in college isn’t wrong. But that dream will require skills – mad skills. And at some point along the way, you’re going to have to really develop those skills and not just try to “show” them. As coaches, we need to REALLY focus on improving the softball skills of our players and not just playing games and scrimmages. And we need to help our players develop their academics, their teammate skills, their dependability and mostly – we want them to play softball because they love playing softball – no matter where that takes them. Enjoy your ride! Team Culture: The key to Your Team’s Success (eClinic) REMINDER: if you’re a Vault Classic member then you already have this eClinic in your locker! 1) Make sure it’s your daughters dream, NOT yours. 2) Allow her to dream big, even if it seems impossible. 3) Be realistic about your daughters skill level (have other people who know advise you). Most parent opinions are biased. 4) Realize you will spend more time, energy and money chasing the “scholarship” (which usually is not full unless your daughter is elite) than if you just played locally, improved and had a great High school experience. 5) It’s the journey, NOT the destination that counts!! View time spent with your daughter (during car rides to lessons, practices and tournaments) as the prize. Have that best friend relationship with her that someday, when her softball career has ended she will look back with fondness and remember the good times she spent with mom or dad. 6) I know it’s hard but try not to live and die on every at bat, every game won or lost, evry time your daughter fails (because she’s going to). You will realize much too late that all the leadup to where you are now (the 12u championships that seemed sooo huge) all the stress and drama really was honestly kinda silly. 7) MOST IMPORTANT: Regardless of how the game goes and they played. After the game keep it simple: “Good job, I’m super proud of you. I just love watching you play. ” It will make for a much better relationship and a much more enjoyable time for your daughter. Thanks to softball excellence for great teaching articles, coaching and most of all promoting young women through sport. Thanks,that was a reveal. Superb! A friend of mine posted this 4 years ago….Do you know who that might be Cindy Bristow? So once you get to college, practice these. •Make Yourself Smarter – After all, school is about learning so make an effort to learn as much as you can. The subjects you’re good at are easy to learn since you like them, so make an effort to get smarter at the subjects you don’t like as much. After all, schools an investment in yourself. By paying attention and getting smarter, you’re making yourself better! •Make Yourself Present – The legendary Basketball coach Pat Summit always made her players sit in the front in every class they had. She had 2 reasons; one was to show the teacher that basketball players were serious about learning, and the other was to make learning easier by being at the front. I think it’s great advice so make yourself better this school year by sitting in the front of each of your classes. •Make Yourself Well-Rounded – If you’re like most softball players you’re playing school ball, travel ball, fall ball, winter ball, ball, ball, ball. While it’s a great way to improve your softball skills it doesn’t make you very well rounded. And, too much ball can burn you out and make you dull toward the thing you love – which is softball. So use this school season to broaden your experiences by trying something new – join the band, or the choir, or take auto shop or wood shop – anything new that will challenge you, teach you and help you enjoy softball when you get back to it! •Make a New Friend – Everybody’s nervous when school starts, so help someone else feel good by making at least 1 new friend. You’ll meet people in school that will remain your friends for the rest of your life, so be nice to the kids that look really scared, and work to make at least one new friend! Attitude is everything so make sure you take a great attitude into your new school year! Thank you,Cyndy, Your 5 points are right on target! Focusing on the fundamental skill sets and putting “classroom skills” first… now that’s putying on the right shoe first!! Thanks Mike Bertisch – I’d forgotten about that one!! Hope Maddog kills it this year! !